WHEN WAS YOUR 1st INTRODUCTION TO THE AMERICAN BULLY BREED? YOU HAVE BEEN INVOLVED IN NEARLY EVERY ASPECT OF THE BREED- SHOWING, BREEDING AND JUDGING, WHICH ARE YOU NATURALLY DRAWN TO, AND WHICH ARE YOUR FAVORITE(S)? Training and handling. It’s challenging and the most fun for me. Judging started to come naturally after experience training and handling. WE’VE SEEN YOUR DOGS IN THE SHOW RING AND FREE STACKING, HOW DO YOU GET YOUR DOGS TO BEHAVE SO WELL IN THE RING? Practice. I started out initially getting them to stack for pictures. I work with them from puppies all the way up. Work with them 5 mins in the morning, 5 minutes at lunch, 5 minutes in the evening. Even if it’s 15 minutes a day.. you’re working. Any more than that and the dog loses focus. “Keep the training fun, and make sure you don’t turn train time into work.” I reward the dog with bait (treat). A lot of the time I use hot dogs, as they get older I use salmon flavored treats. One training exercise I utilize is walking 5 feet and stopping, walking another 5 feet and stopping. When they stop I hit them with bait. It’s simple, and a lot of people used to think I was crazy for it, but it helps your dog get on the same page as you, helps with control as the dog syncs his movement with yours and also builds the bond between you and your dog. Remember, keep it fun for your dog. AS A JUDGE, WHAT ARE THE QUALITIES THAT YOU LOOK FOR IN A DOG? WHAT TRAITS (IF ANY) DO YOU PLACE THE MOST IMPORTANCE ON? It’s hard to pick one trait, but first of all you should be able to look at the dog and tell it’s an American Bully. The dog has to have a substance, structure and head. The dog also has to have good temperament, and be healthy. I can’t stand aggression. Aggression takes away from the ring and competitors there. WITH SO MUCH EMPHASIS ON A “BULLIER” DOG, DO YOU THINK THAT TAKES AWAY FROM SOME OF THE QUALITIES THAT MAKE A GREAT SHOW DOG? Yes and no. The bulliest dog is not always the show dog. There should be a balance. It’s the balance between the bully or exaggerated features and movement that makes breed type. Balance is key. We need to start breeding toward both. What I mean by that is a complete dog. So many breeders are breeding towards the exaggerated features- the bone, head, but they lack the movement. On the flipside, if a dog moves like a fox but lacks type- it’s missing something as well. It all goes back to balance, balancing breed type, with structure and movement. YOUR PRODUCTIONS HAVE BEEN ONE OF THE MOST CONSISTENT WE HAVE EVER SEEN, HOW DID YOU GO ABOUT PRODUCING SUCH QUALITY ON A CONSISTENT BASIS? I breed from the back forward, I prefer a strong rear and to build from there. Making picks from your litters is also extremely important. You want that american bully head, 90 degree stop, chiseled cheek bones, a strong neck, muscular shouders, wide hips and an angulated rear. Making your picks (the pups that you keep for your breeding program) determines the future success of your program. So many breeders make the mistake of picking the bulliest pup out of the litter. 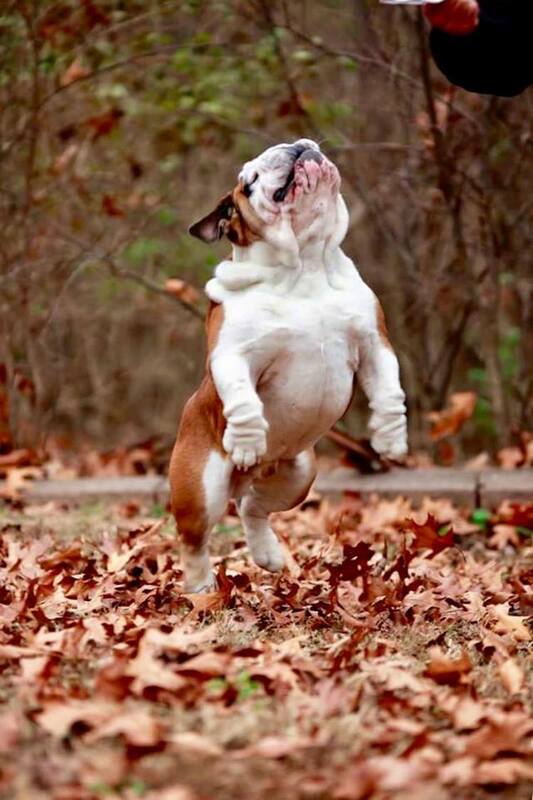 The bulliest pup is not always the best pick. I try to find balance when making my picks. WHAT INDIVIDUAL DOGS HAVE PLAYED THE MOST IMPORTANT ROLE IN YOUR PROGRAM? Grand Champion Garfield, Blockbuster, Frank Lucas, and more recently Bone Crusher. The aforementioned dogs have played a huge role in Black Label’s success. Bone Crusher will play an extremely important role in the future of our program. IF YOU COMPARE YOUR DOGS TO MOST OTHER KENNELS, REAR ASSEMBLY IS ON A DIFFERENT LEVEL. HOW DID YOU GO ABOUT PIECING TOGETHER YOUR PROGRAM TO PRODUCE THAT, GENERATION AFTER GENERATION? The pedigrees match up like the dogs match up. Breed the dogs in front of you first, pedigrees second. What I mean by that is, just because a dog has a great pedigree, if the individual dogs don’t not carry the traits you’re looking to pass on, then what good is the pedigree. Both need to match up like a puzzle piece. Bring in the qualities you lack without bringing in bad traits. My goal with each breeding is to improve, always improving and never getting comfortable. Secondly, with the rise of social media, so many people are breeding off of photos. If you’re looking to add bone to your program and you’re selecting a dog that you’ve never seen in person and just off of a photo, how do you know the dog has the qualities you’re looking to bring in? Ask for video. Another problem is photoshop. If you select a Stud that was photoshopped in the photo you selected him off of, he may not even carry the traits you’re after. BLACK LABEL IS A FORCE AT NEARLY EVERY SHOW, HOW DID IT START AND HOW DID IT GROW INTO WHAT IT IS TODAY? After the first fun show I went to I was sitting at home drinking Johnnie Walker and relaxing and doing a little bit of thinking. The first name I had for my kennel was JJJ (named after my kids) but I kept getting asked if the name was gang related, so I decided to change the name to Black Label Cartel. I come from a big family, and I noticed at shows most people were by themselves. Like I said, coming from a large family, I loved big dysfunctional families. Black Label Cartel was created to be family- a group of kennels that love the breed, go to shows and have fun together. WE’VE HEARD THAT YOU NOW HAVE A BULLDOG? CAN YOU TELL US ABOUT THAT? I have some good friends who bought an English Bulldog, and this thing was ugly.. I get a call from them and they both train Crossfit, and they were saying that the Bulldog couldn’t keep up with them on runs. I told them of course he can’t “he’s an English Bulldog!” Long story short, they ask me if I would be able to take care of him. So I took in this ugly dog. I began to train him like I train my bullies. To watch this dog move will put a smile on your face, honestly I don’t know how this blessing fell into my lap. A dog that someone didn’t want is killing it in the show ring. He is currently the #2 ranked English Bulldog in the world. He takes so much pride in showing, it’s fun to watch. It just goes to show that anything is possible if you put in the work you can succeed. Take a look at the Top 3 ranked dogs in the world; Grand Champion El Toro, Grand Champion Bear and Grand Champion Bowser. It’s evident their owners work with them. Watch these dogs when they stack, they don’t move. This doesn’t happen in the few weeks leading up to the show, when so many try to prepare. The work should be done before the weeks leading up to the show, in the weeks before the show all you should be doing is finessing what your dog already has learned. LET US SAY THAT IT HAS BEEN AN HONOR SPEAKING WITH YOU. IS THERE ANYTHING THAT YOU’D LIKE TO LEAVE OUR READERS WITH? One thing that I feel needs to be addressed is Sportsmanship. I challenge everyone- in and out of the ring, to practice good sportsmanship. Whether you win or lose, and whether or not you agree with the result doesn’t matter. Shake your opponent’s hand and thank them. There are lessons to be learned in each win, and even more to be learned in a loss. Without good sportsmanship, we take the fun out of the sport, and we lose what knowledge we could have gained in that instance. IS THERE ANYONE THAT YOU’D LIKE TO SHOUT OUT? Yes! The awesome countries I have judged in: Mexico, Spain, Nicaragua, Columbia, Indonesia, Peru, Holland and the United Kingdom. It has been an honor. Thank you.